Dwell by Cheryl: "Market Inspiration"
Hope you guys had a great Father's Day weekend, I sure did. I realized recently that I never really shared my experience at the High Point Market on the blog. In April, I had the opportunity to travel to High Point to my very first Market. 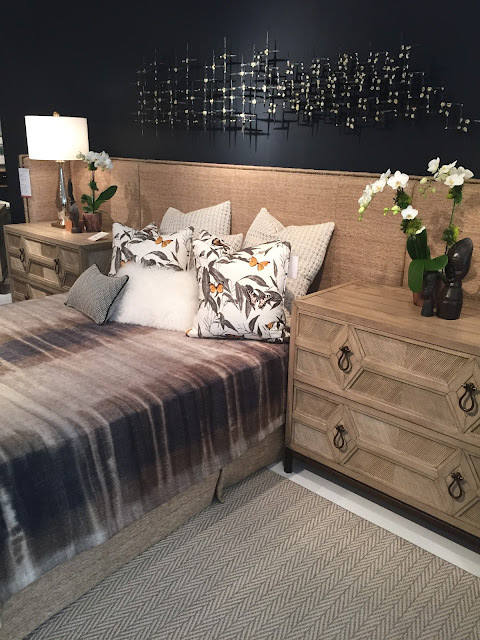 Convening every six months, The High Point Market is the largest furnishings industry trade show in the world. Anyway, there was lots going on that week and I just never had the time to sit down and sort through all of the photos I took to share with you a few of my takeaways. While I'm not here to do a total recap today, I did want to share some of the inspiration that I came across. 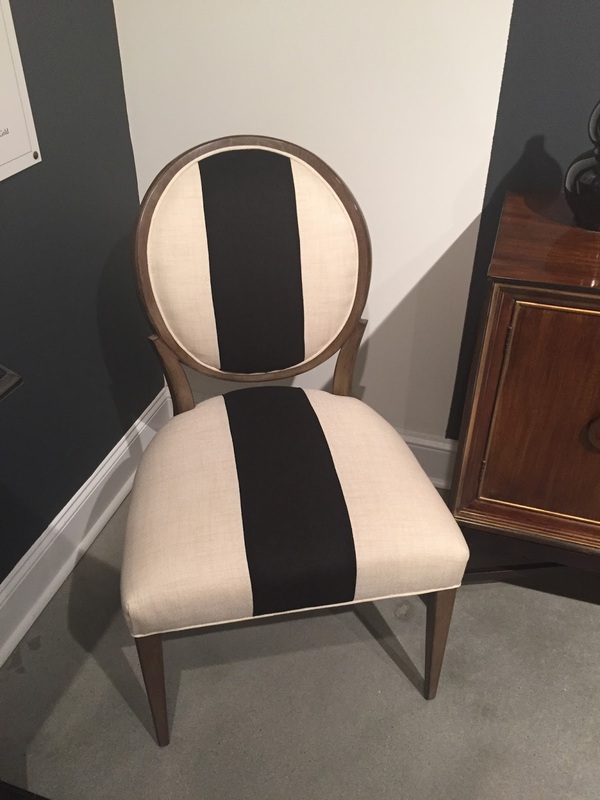 You know I love a furniture transformation, so my eyes were peeled for great ideas on how to spruce up vintage and budget friendly finds with creative upholstery. Thankfully, there was NO shortage of ideas to "borrow". I had Baity's Custom Upholstery on speed dial texting back and forth about whether we could do something similar. For example, I loved this ottoman. I'm pretty sure my upholsterer could custom make this piece. I love the fact that it has storage underneath and brass nails for days. 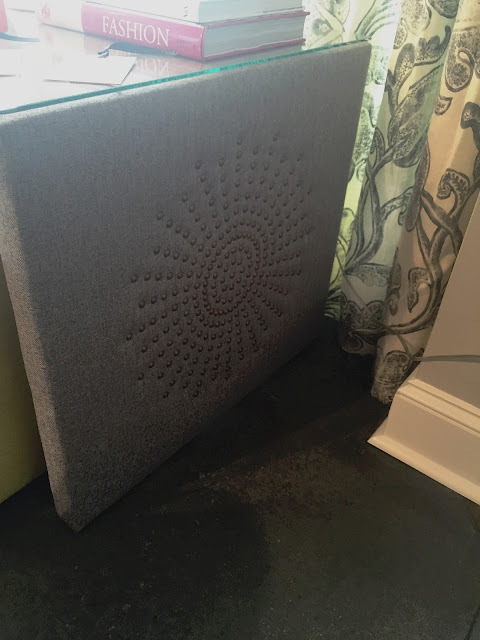 While it's not the best photo, I snapped this shot because I thought adding an embellishment with nailheads was a fabulous idea, especially on an upholstered console/desk. This Ambella winged headboard was the coolest I've EVER seen. It literally enveloped the bed and the bedside tables too! Genius! Sure it's large, but not at all difficult to create. 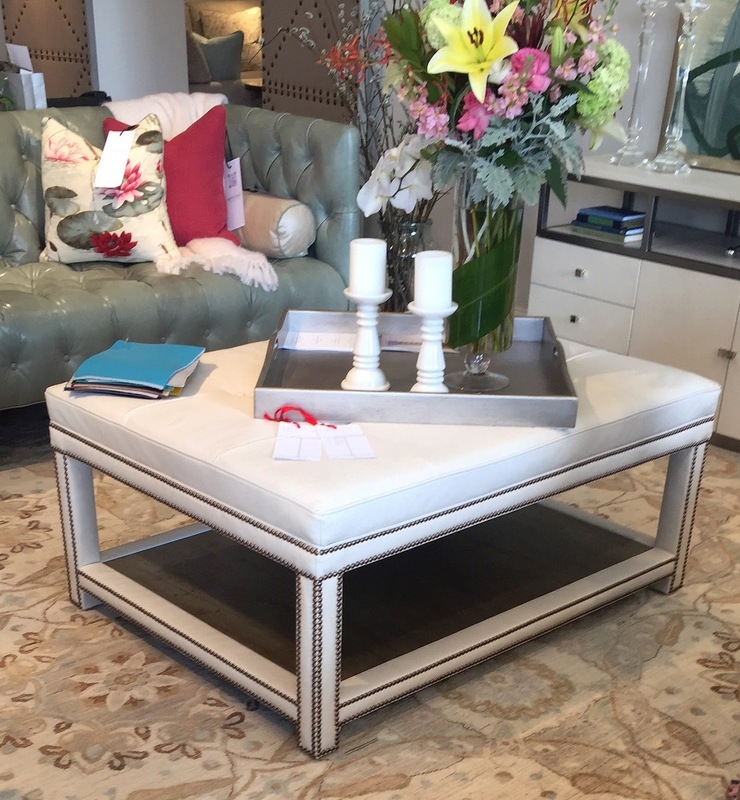 I often have clients who need to utilize some of their existing furniture pieces due to budget constraints. 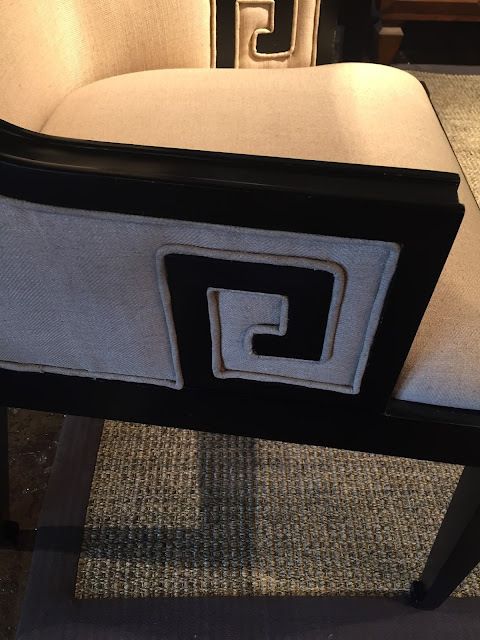 I thought this simple detail did wonders for a simple Parsons chair. We've actually done the racing stripe before, but not on a Louis chair. Definitely filing that one away in my inspirational Rolodex. 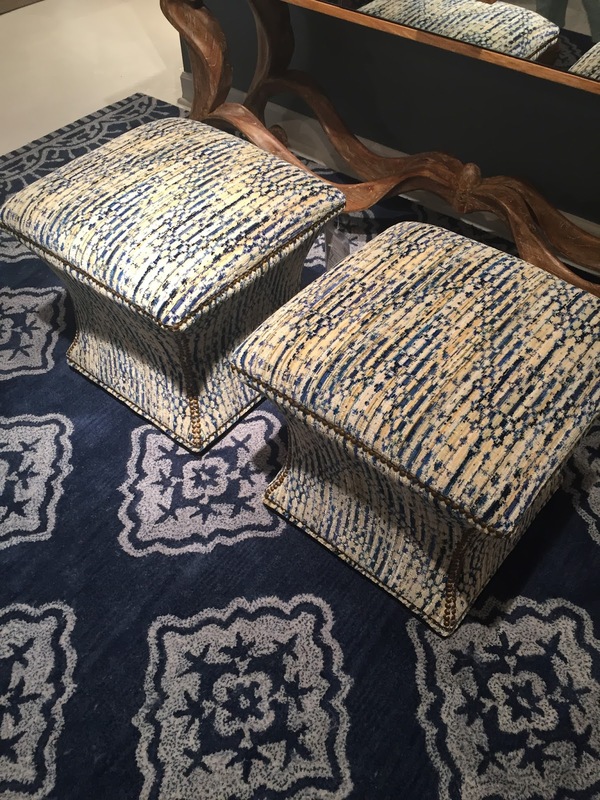 These reminded me of the custom ottomans in my Master Bedroom Makeover. There was lots of trim and brass nails. 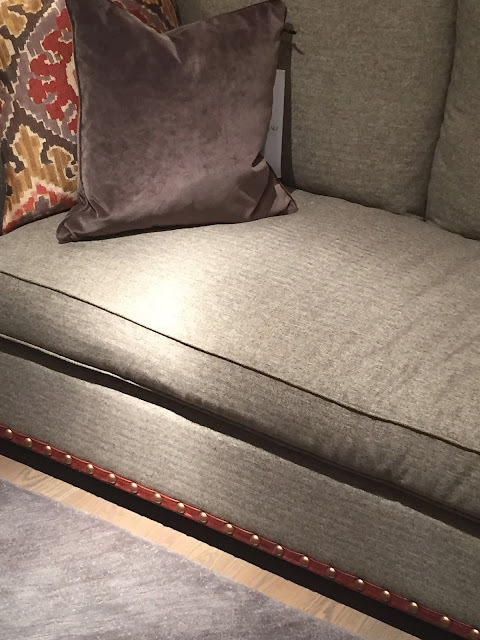 How clever is this simple addition of leather trim tape and brass nails used as a border on this sofa. I MUST, MUST, MUST use this idea in a project. 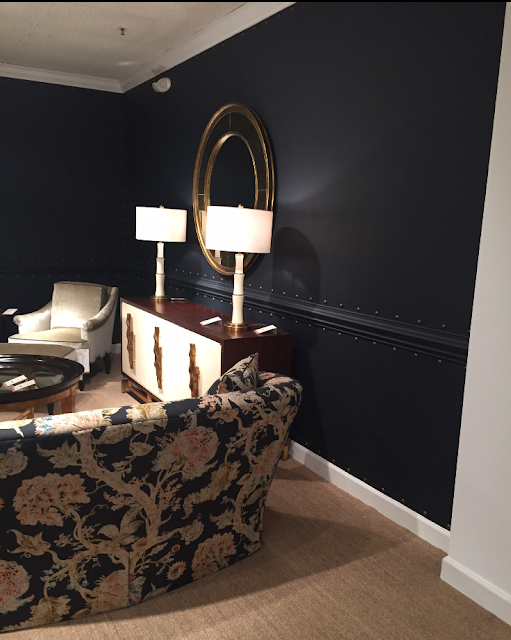 Large brass nail trim applied directly to the walls is the perfect finishing touch. I'm think it would be perfect in a study or dining room. 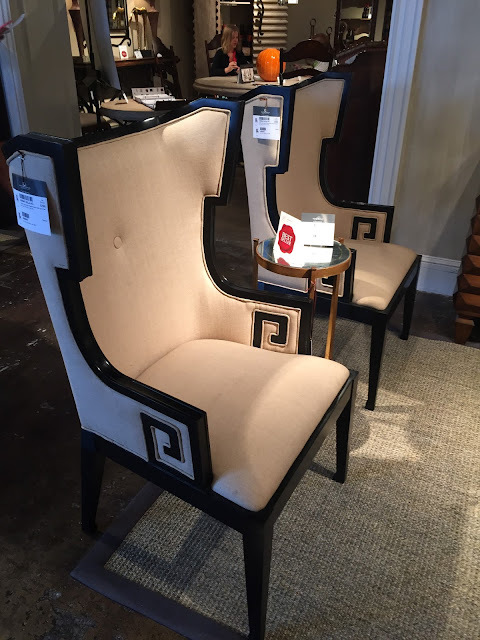 Last but certainly not least, I fell in LOVE with these chairs for a number of reasons, but mostly fore the Greek key design. 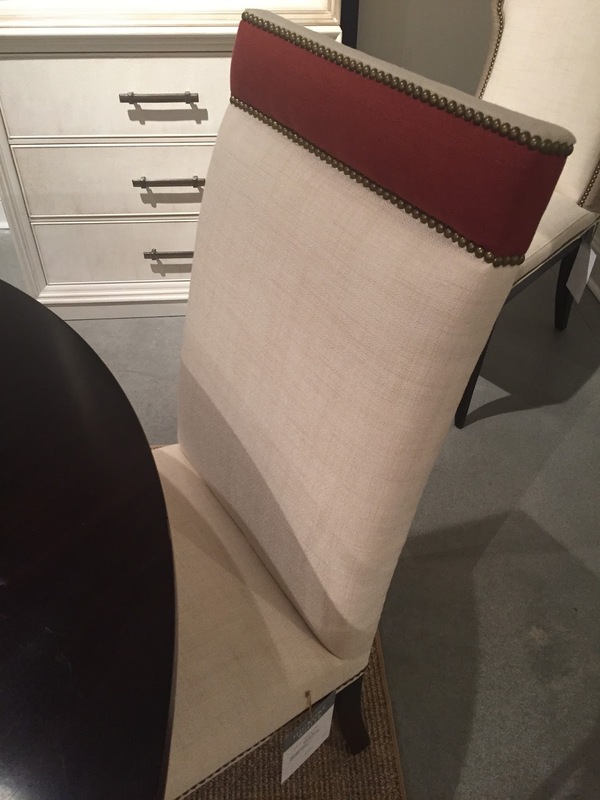 It looks as if it's the wood trim at first glance, but upon further inspection you can tell that it's actually fabric and contrasting welt. I mean, WOW! Let's just say I left with more than a few great ideas. You can expect to see them in my projects real soon.